Did the Easter Bunny leave you any carrots? If so, you may want to make these! They’re Carrot Cookies, much like a carrot cake cookie but lighter and more delicate. These Easter-and-beyond treats are wonderfully flavorful and unique. I tried them with both white sugar for a lighter texture and color, and with brown sugar and walnuts for a more dense, carrot-cake-like consistency. 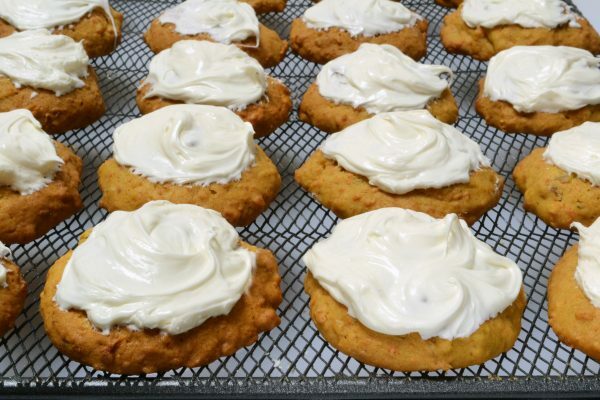 I then slathered the cookies with cream cheese frosting flavored with a hint of orange zest. I think you’ll enjoy the lighter-than-air quality to these cookies and I’ll bet they’ll make a fabulous addition to your Easter or anytime cookie platter. If you’re looking for a new sweet treat, give these one-carrot jewels a try! In a large bowl with electric mixer, beat butter and sugar until light and fluffy. Add egg, grated carrot and vanilla, mixing well. Sift together flour, baking powder and salt and stir into carrot mixture. Stir in chopped nuts, if using. Drop by teaspoonfuls onto greased or parchment lined baking sheets. Bake at 350 degrees for about 14 minutes or until slightly browned on top. When cool, top with cream cheese frosting. Beat together cream cheese and softened butter. Mix in powdered sugar, vanilla, salt and orange flavoring or zest. Note: If you prefer the basic cream cheese frosting, omit the orange flavoring or zest.